There’s a certain satisfaction for me when I find and create a simple graphic image. It doesn’t happen often enough, or perhaps I’m not looking hard enough. Here we have strong horizontal lines, and the contrasting colors that, I think, makes this pop. The warm colors, from just before sunset, certainly doesn’t hurt. 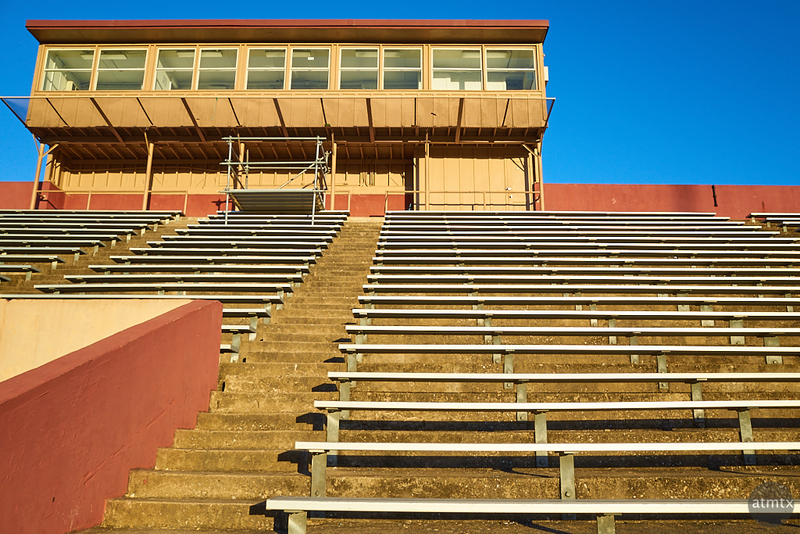 I made this image at House Park Stadium, the Austin School District’s main venue for high school sports. I was there that day, to capture my son’s lacrosse game. While I shoot the game itself with a low-end Nikon DSLR with a long telephoto lens, I sometimes carry my compact Ricoh GR, just in case I find something interesting. The blocky cement structure with aging control tower has just enough character for added visual interest. It’s not as fancy or new as the richer western suburbs, but photographically, those newer, mostly metal structures, don’t compare. Part of my Daily Life Collection where I capture everyday images, in a slightly different way, as I go about life in Austin.